Discussion in 'Trip Reports' started by Kevin C, Sep 20, 2018. After predictably not getting last minute permits for the Subway our small group of 5 decided to give Misery canyon a go. It was everybody's first trip through Misery, and the plan was to start with the east fork, take the exit back up to the top then try and loop around for the west fork if there was enough time. We hoped to move fast. Turns out we got to see both forks, but not in the way we planned. We got a started a little later than planned at 8:00 AM. 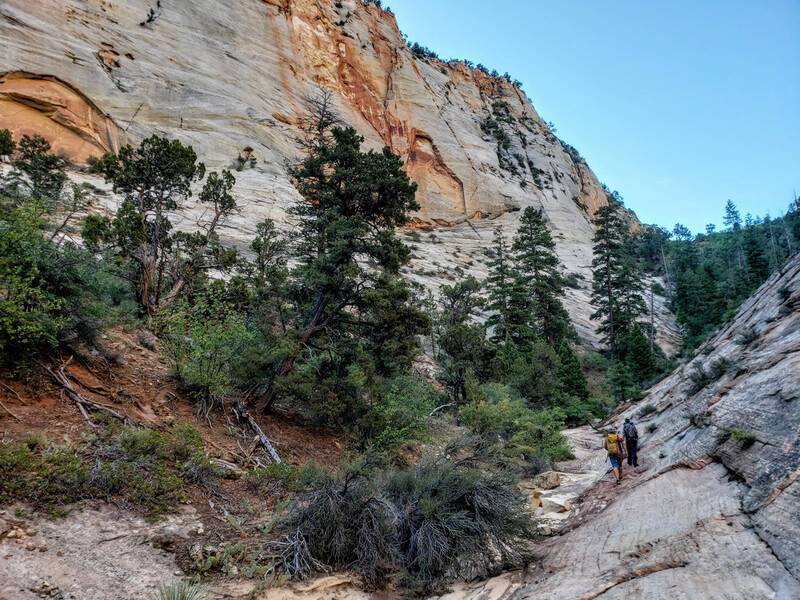 Just as the beta claims the approach and exit are long and mostly full in the sun, but with big and unique views of the Zion landscape. I had always thought that Misery Canyon got its name because of the long approach and exit (that's not the case See Toms Beta for the actual reason). Our group didn't mind the approach the views being its redeeming quality. After 2.5 hours we finally reached the top of the East Fork. We played a short game of who can stay dry until several short swims were encountered; Misery appeared to be in waterpark mode. Hard to say, seeing as how this was all our first time through, but we ended up spending all day in the water. No one had wetsuits, but the water was warmish due to recent rains, there was plenty of sun between narrow sections to warm up when needed. Apparently everyone in our group except our last guy walked right past this little fella having a mid-morning snack. This was the second rattlesnake we encountered in the East Fork. As mentioned we spent most of the day in water, and most down climbs were into chest deep pools. We managed to stay warm by moving. After the one mandatory rappel that Anthony Dye ended up down climbing, because you know ...Its Anthony. We took a short lunch close to the where the West and East Forks meet. By this time we knew that we would likely not have time to loop around to descend the West Fork. So in the interest of getting the biggest bang for our long slog out we decided we would try to reverse the West Fork and see as much as possible until we meet an obstacle we couldn't overcome. We predicted we would likely be stopped at the either of the 40’ raps up canyon. 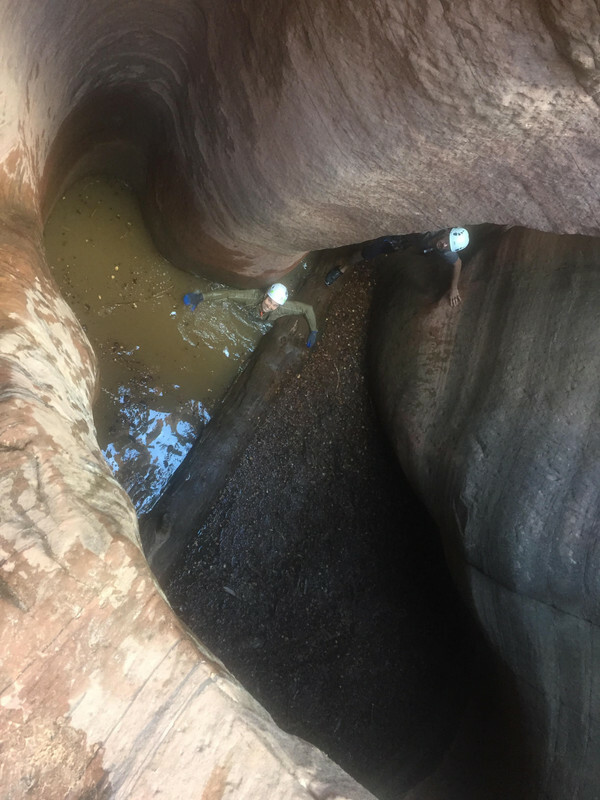 This was an “in canyon” decision, and we only had two VT Prusiks, two Microtractsions, and one pot shot to overcome any obstacles. Game on! 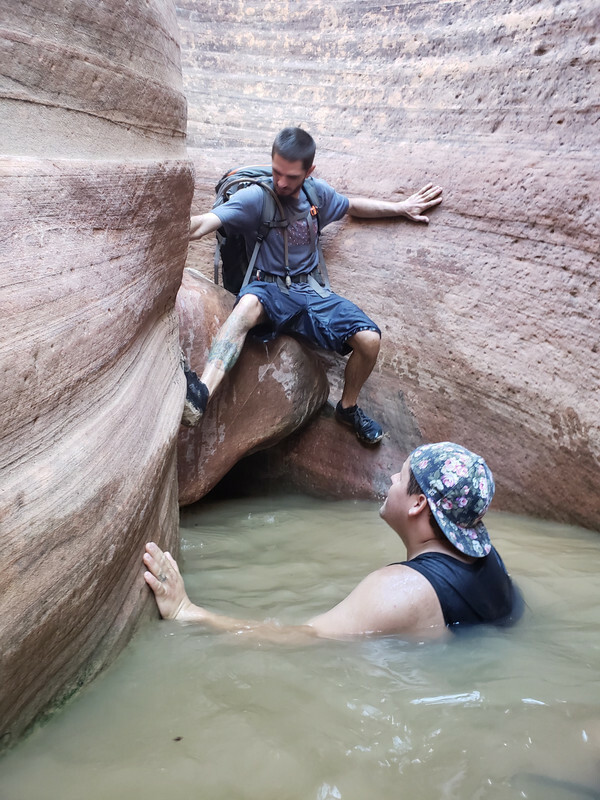 Shortly after scrambling up into the West Fork we encountered our first major obstacle. This was an open bowl. There was no way to climb up, and no ways to stem up to get a good pot shot throw. There appeared to be a small V slot about 15’+ up that might accepts a potshot and allow an ascent. We filled out pot shot a little less than half full with the only material available, mud. Anthony was our thrower, and I managed ropes. After two failed attempts, Anthony hit the sweet spot on his third attempt. The potshot appeared to be wedged solid, even with Anthony and me hanging on the rope it held in place. Anthony rigged to ascend with his VT Prusik, and Micro Traction with a foot loop. 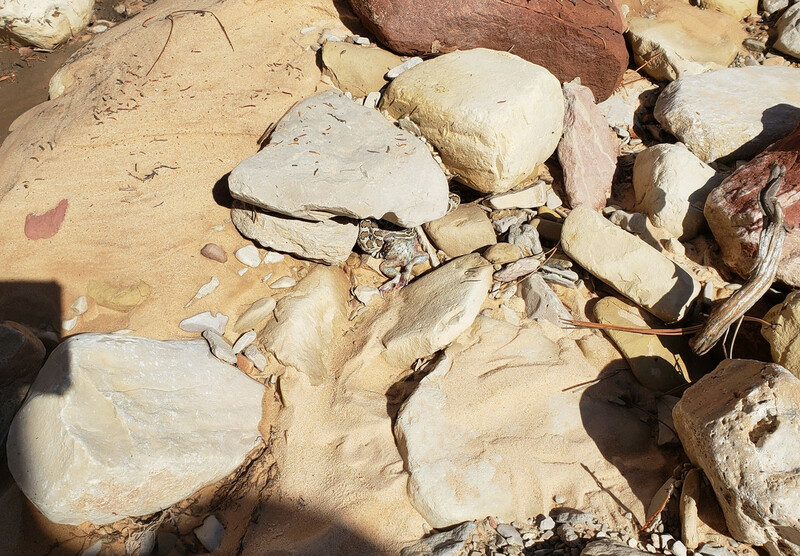 With no water below just rocks to greet him if something went wrong, in retrospect we could have or should have put our packs down in the landing zone to provide some cushion, as it stands we opted to provide a spot to protect his head if he were to fall. Towards the top the walls became vertical and Anthony was able to use some minor holds to transfer some of his weight off rope as he climbed up and into the V wedge as the angle of the rope pull became more horizontal. Once Anthony was up we used a dead man's anchor to rig a 2:1 pull with micro traction to get the rest of the group up. Okay first major obstacle down. That was fun! We continued up, and found several small climbs that were overcome with partner assists. The deep water reduced many penalty points for most, and probably allowed us to start a little higher on some climbs than if the canyon was dry. This was turning out to be an amazing day, we still were waiting to meet the challenge that would block us and send us back down canyon. 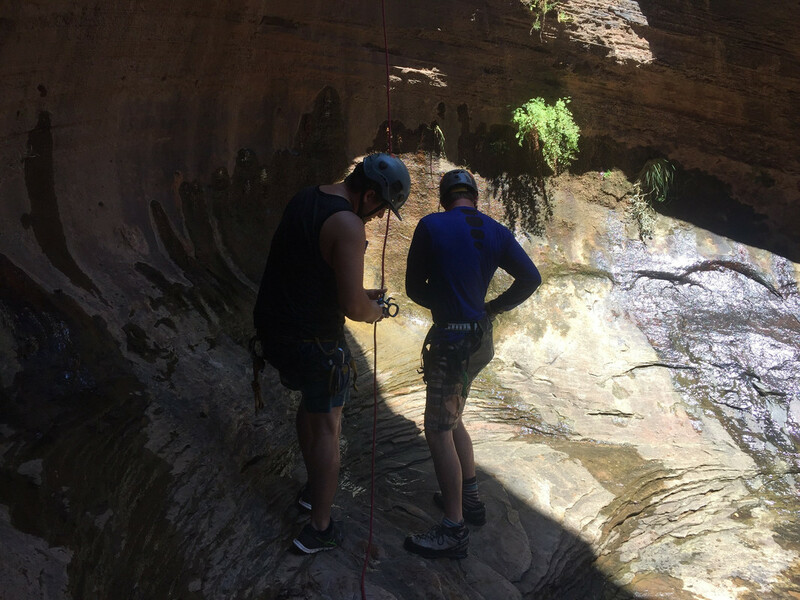 Two 40’ rappels were ahead and were bound to stop us...right? 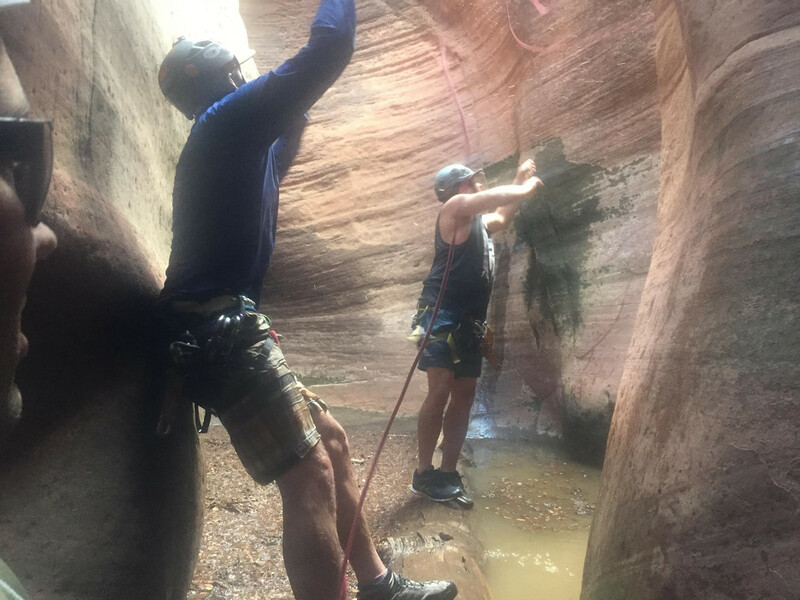 By a stroke of good luck we were actually able to bypass the next 40’ and the next 17’ rappel by skirting the west side of the canyon. This bypass required an awkward jump/leap down 5’ (protected well with a spotter) that would be awkward and difficult to complete in reverse (i.e. going down canyon). Wow, that was lucky we starting to believe we might actually reverse the whole fork. One more obstacle the last 40’ rappel. The last obstacle proved to be the most unique of all. Again there appeared to be no way to up climb directly, though we saw some alternative climbs down canyon to get up and out that may or may not go. 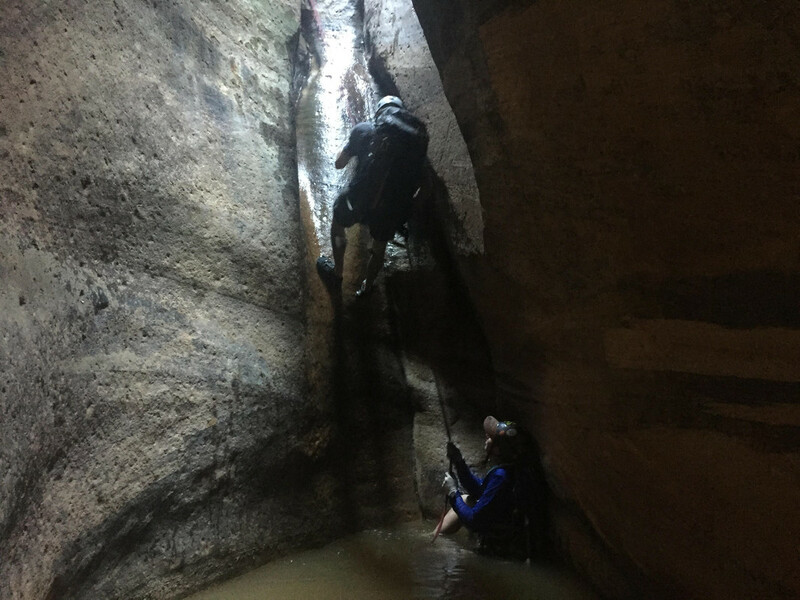 The last obstacle was a chamber filled with water and we could not touch bottom. Amazingly there was a huge log that fit perfectly in the chamber that could be pressed against the wall in order to make it stable enough for someone to go out and stand for a pot shot throw, I mean you can't make this stuff up. This allowed a person throwing the pot shot to get a decent angle. Without this log it would have been a much harder throw and angle, probably impossible. Even standing on the log the throw was close to 17’ up, it was again close to Anthony’s max range, If water levels were lower and the log was not floating so high then again the throw would probably be impossible. The canyon Gods must have been in an appeasing mood. Anthony sunk the shot on his second attempt. The potshot pulled for about a foot then held. I volunteered to climb this time, and with the deep water I knew penalty points if the potshot failed would be less severe. I ascended up the flute using the same setup as the last obstacle. However this time there were no holds at the top to help as I got closer to the top and the rope pull angle changed. However as I got to the top the wall started to become less than vertical and I was able to turn and slide my hip on the wall to help. The caution was well advised as when I finally got high enough to see the pot shot I noticed that it was wedged against a large chock stone and only ⅓ if the bag was behind the pinch point. It looked to blow at any minute. I was at the point where every move had the real potential to release the system and send me sliding and falling down into the deep pool of water. The chute narrowed at the top and with one last cautious adjustment of my Micro Traction and foot loop I was able to get high enough to stem my arms against both walls and beach whale my way up the last 4’. Top down view of the last obstacle with the strategically placed log in the chamber. Amazed, and little dumbfounded at our luck we found ourselves hiking out of the West Fork. 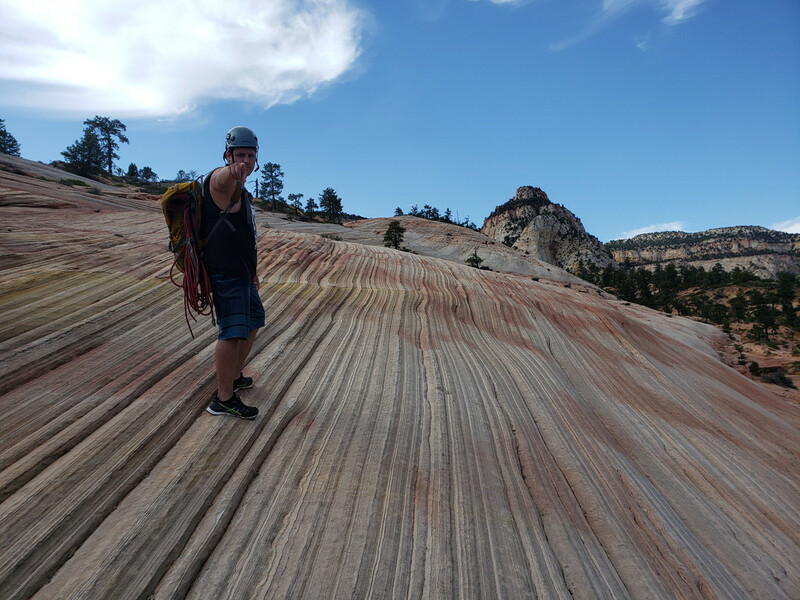 We were slightly bummed that we missed the confluence down to Parunaweep, I guess if we had planned ahead we could have fixed our ropes for the very last 40 rap played at the Parunaweep canyon, ascended back up the last rap, and then try to reverse the West Fork. Maybe we can try that next time. However I’m not sure that the 40’ rap in West Fork could be overcome if water levels were lower. We may have just been really, really lucky to get perfect conditions for reversing the West Fork. Either way it was one of more fun days playing in canyons, and one I won’t soon forget. Jared Robertson, Preston Gable, Kuenn and 8 others like this. Kevin C and Anthony Dye like this. 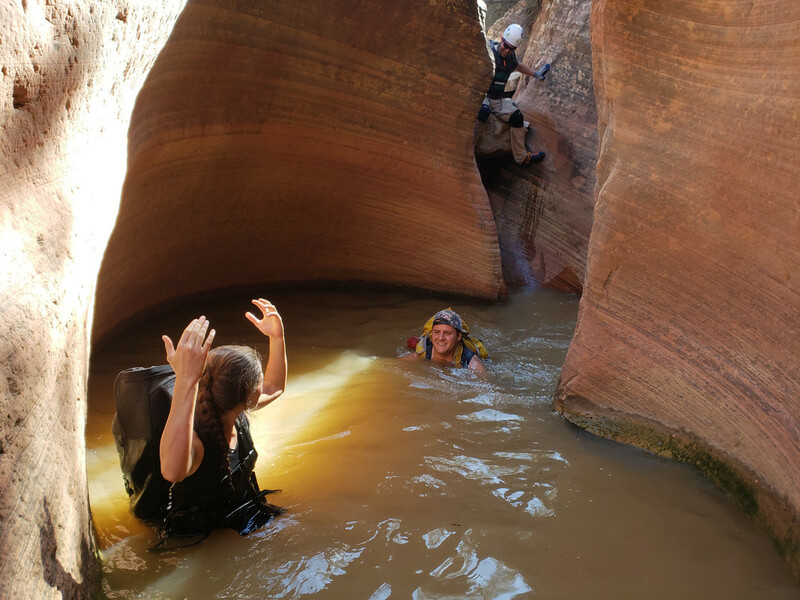 Fun day, it's great to have a group that is willing to try weird canyon stuff!